I can remember way back when I had to create a freelance writing resume and was literally lost and didn't know where to start. I happen to already be writing for a few places, so I had some experience to place on the resume (which generally helps). After searching for days and trying to find examples from different freelance writers, I finally come up with a resume that worked best for me. If you're having problems creating your freelance writing resume, then I have some tips I hope may help. Use a basic template. Nothing fancy. As many of you already know, start out with your person information at the top. Now some people may decide (which I did) to only include their name and email address. Seeking a challenging and responsible career as a professional freelance writer by providing creative and unique writing to increase traffic and SEO. Make sure your objective fits whatever position you are applying for. Next section will be dedicated to your writing styles. Always make certain to list the type of style that is relevant to the freelance writing position you are applying for. Next section will be for listing your previous work experience. This is current and previous freelance writing work experience. It is a good idea if you do not have any previous writing experience to publish some articles before applying for any writing jobs that require a resume. Some places you might want to consider publishing some work would be Associated Content, Helium, etc. Keep in mind, this section should probably only include experience you have in the freelance writing field. Personally, I leave out any jobs that do not relate to freelance writing. The next section of your freelance writing resume should be for your education. If you have any type of certifications then I would also list them in this section. This is a basic freelance writing resume. It is simple and to the point, but it has worked for me and many others in the past. Well the Thanksgiving holiday is over and Christmas is next. I shouldn't have to remind everyone just how hectic it is during this time of year. Many freelancers want to work more so they will have more spending money for all those Christmas sales, yet it is hard finding enough time to get in the extra hours, or at least it is for me. Since my last post about Info Barrel, I have read through everything 2 or 3 times, lurked around on the forums, checked out their contests (which are quite awesome by the way) and started doing some keyword research for some articles. In fact, I have 10 articles already live on the site. Of course, this didn't happen until this past week. But hey, I am trying. Anyway, while writing up some articles and reading the forums over at Info Barrel, I decided I need to add HubPages to the list. First of all, it will give me a place to link up some of my Info Barrel articles, and second, it will maybe bring in another form of residual income. You shouldn't have all your eggs in one basket anyway, right? So, let me give you a little overview of Hubpages. As I mentioned earlier, it is a residual income site. This site allows you to create pages, or what they call hubs. On these pages, you have content, pictures, videos, and those great affiliate links. How do you earn money with your hubs? Actually there are several ways you can earn money with your hubs. It can be through Google Adsense, Amazon affiliate program, ebay, or Kontera. These are automatically placed on your hubs and you receive a portion of the earnings. With that being said, you would have to sign up for an account with each of those places in order to earn money from them. Now when a reader visits your hub, 60 percent of the time they will see Google Adsense ads linked to your account, and 40 percent of the time they will see Google Adsense ads link to HubPages account. Therefore, if someone clicks on your ad when your link is showing, you will receive 100 percent of the profits, but if it is clicked on during the 40 percent time when HubPages is there, they will keep 100 percent of the profit and you earn nothing. This is why you will read that you get 60 percent of Google Adsense income. Some sites pay a portion of each ad, which is what we are more use too, but that is why HubPages is different. As for Google Adsense, you don't have a choice, it will show up on your hubs whether you have an account or not. Of course, if you don't have an account then your cheating yourself out of some money. As for Amazon, it works basically the same way with the 60 percent and 40 percent, however, you can choose not to have Amazon on your hubs. As for eBay and Kontera, you can choose whether to use these affiliate programs as well. At the present time, eBay is the only one I do not use. This site also offers a way you can make just a little bit more money. If you refer someone to HubPages with your link, and they join within 30 days of you referring them, you will receive an addition 10 percent of their ads impressions for life. This DOES NOT take the 10 percent from the new member. So, if you are considering joining HubPages, the I would love to refer you. You can sign up by clicking here. However, don't feel obligated. If your article or hub is flagged, in my experience I've have always had the opportunity to correct it. If you treat your article more like an informational type article, even if you are reviewing a product, then you should be fine. Now about my new journey with HubPages. I actually abandoned my old account that had about 20 hubs on it from a long time ago. They weren't great articles and were merely put on HubPages while trying to build backlinks to a blog I was working on. Now that I am more focused on my residual income, I wanted to start fresh and work on my keywords more. So, I am up and running now with a new account. I'll keep you posted as I journey along. If you do decide to join, you will find the forum full of useful people that are making some great money on HubPages. Definitely take a peak in there and see just want you can learn from all these experienced hubbers! 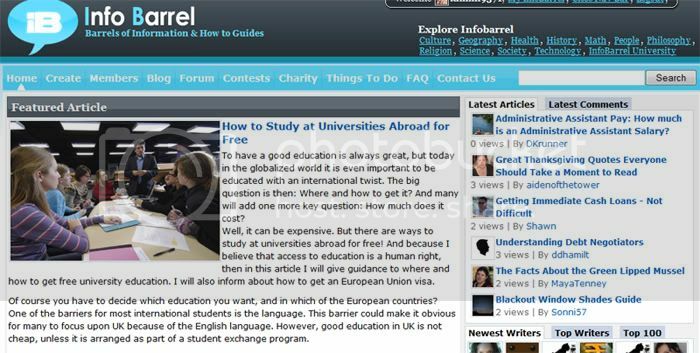 A good while back I did try out Info Barrel for just a short period of time. I can't remember exactly what came along to cause me to stop writing for them, but it had nothing to do with the site. It was a matter of priority at the time and probably the fact of needing some upfront money instead of building residual money. Now my plans have changed. I am working on scheduling more time for Info Barrel as well as a couple of other places, which I will talk about later in another post. As many of you already know, I use to write for eHow, and loved it. My only problem is wishing I had wrote more articles before their big change. It's one of those things of if you knew then what you knew now....oh well. Life goes on and you learn from those mistakes. I do, however, earn an average of $80 a month from them even now. So, this is what left me with the decision of trying to find other sites to write for like I did eHow. When I started trying to decide what to put more effort toward, I thought of Info Barrel. One of the reasons I like them is they are not so strict with their guidelines. This self publishing site allows you to earn a residual income. You can do this through Adsense, Amazon, and Chitika. As of right now, I have my Adsense and Amazon IDs on there, but I plan to add Chitika at some point. Now keep in mind I already have 3 articles written there from a long time ago, but I'm not even going to think about those because they were articles from when I first joined in 2009. How Much Can You Make at Info Barrel? You can earn from the multiple streams of income I mentioned above, but the best part is Info Barrel shares 75% of the Adsense revenue with you. In my opinion, that is great! You earn money every time some clicks on one of the ads placed in your article. I think I like this better than basing it on the amount of views your article gets. I know some writers are making really well with Info Barrel and each time I read their income reports, it makes me want to get started even quicker. First of all, Info Barrel has some great support. Not only that, but they have an awesome forum to stay in touch and get some great tips from other Info Barrel contributors. You can write any type of article and format you like. The last time I checked, your articles did need to be at least 325 words in length, but is recommended to be 400 in order for your work to be indexed. You can choose one of their formats, or you can actually just start with a blank page. You are allowed to insert up to 2 embedded links in your articles, excluding the first paragraph. This is great for anyone marketing their own articles on their own blogs. It will help with your backlinking efforts. Another cool benefit is their referral program. This program will allow you to earn a portion of the revenue from the referral's content. The last I checked on this is you get 2% of all add impressions on the referrals article. According to Info Barrels Terms of Service, you keep all the copyrights to the material you submit to their site. However, your content needs to be original and not posted on other sites while being posted at Info Barrel. Although anyone can sign up without having to wait to be accepted, your content must still be approved. It will go through a routine editing process so that it can be checked for anything offensive, the amount of links in the content, and to make sure the article does make sense. Don't worry, this is not a big deal. You do not have to be a perfect writer. Just make sure to follow the guidelines and rules and you'll be okay. After you are a member for 14 days and submitted at least 10 articles meeting the rules and guidelines, then you work will start being pre-approved and go life immediately. My plans are to get started immediately and see how well I do. I will keep everyone posted on my progress and I'd love to hear from others about your experience with Info Barrel. Yes, I know...I've been missing in action for quite some time. It's mainly because I have been working hard on my freelance writing for clients. Until last week I have not had the time to come up for air. I also spent just a little bit of time with some affiliate marketing, but I will talk more about that another day. For right now, I am trying to get myself more organized so I can split my time between passive income, affiliate marketing, and still have the time do some writing for some clients. I have so many different directions I want to go in and don't want to decide on just one. So, I'm thinking if I try to schedule my time better I can work on all of it. We'll see how that goes. Anyway, I'm back and I plan on trying to report my progress and findings as I go. Get Blog Updates by Email: Delivered Right to Your Inbox!